After a pretty dodgy July, summer seems finally to have arrived in August. Sunny days and warm temperatures call for refreshing adult beverages. For us, the solution is our latest beer - a San Diego Session Ale. 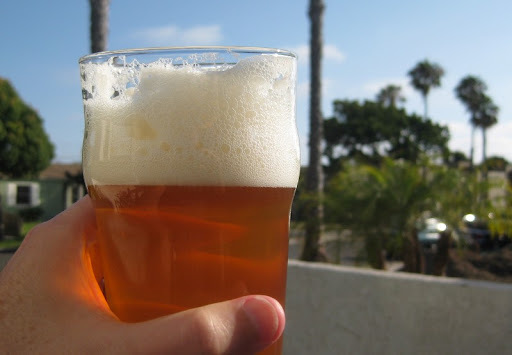 So, why do we call it a "San Diego Session Ale"? Well, first off, by ale we mean IPA - no self-respecting San Diego beer drinker would tolerate a pale ale without a big hop profile. And, as is typical of the style, the hops are more focused on the aromatic than bittering. Dry hop, dry hop, dry hop. As for the "Session" part, it refers to a lower octane beer than you can have a few of without falling on your face. This beer came in at 6.4% abv, and while this might not be considered "sessionable" in most parts of the country, it definitely qualifies here in San Diego where it is not at all unusual for a run-of-the-mill IPA to be 7.5%. To achieve the light color and body, we used a partial mash and late extract addition as we have been doing with most all of our beers. In this case, however, we also increased the amount of wheat malt in the mash. We usually use a half pound of wheat to help yield a nice, frothy head. This time we upped it to a pound and a half. The result was just what we were looking for. The extra wheat we used did a great job of lightening up the beer, without going so far as to turn it into a hefeweizen. Hoppy, refreshing and (at least somewhat) sessionable. A perfect summer beer. 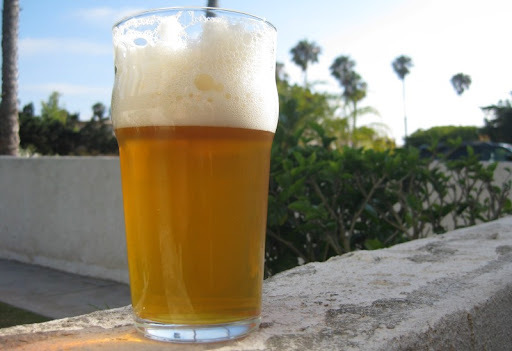 If you don't brew your own, but live in the San Diego area, there are an increasing number of great session beers available. Two of my current favorites are from Alpine: Hoppy Birthday and Tuatara. Port's SPA is also quite nice. Those beers are likely going to be hard to find outside of San Diego, but Alesmith X and Stone Levitation are good too and should be available farther afield. Total batch size = 5 gallons; Partial Mash in 3 gallon beverage cooler; ~3 gallon 60 minute stove-top boil; late malt extract addition; dry hopped for aroma; target abv of 6.5%. Ferment in primary for 1 week, then transfer to secondary. After seven days, dry hop with 1 1/2 oz Centennial, 3/4 oz Simcoe and 1/5 oz Amarillo. Bottle or keg after fermentation is complete (2 to 3 weeks in secondary). Good looking beer! It kinda looks like Alpine's Nelson. Agree on the "session" definition, especially here in SD. I had Green Flash's Xtra Pale Ale (?) a few weeks ago. It's abv was less than 5%, and had it a good kick to its flavor. I didn't know Green Flash made this beer. Need to try Alpine's Hoppy B'day and Tuatara. I haven't had that Green Flash beer yet - I'll have to give it a try. Definitely seek out the Alpine beers. I had Hoppy Birthday at the Real Ale fest, and it was one of my favorites of the day. I had Tuatara for the first time at O'Brien's a few weeks ago - it has amazing flavor for such a low abv (4.2%) beer. Ok so I already bugged you about your imperial stout and now Im going to ask you about this one. Thanks in advance. I am planning to brew both over the next several weeks... This one for summer and the imperial stout to age for next winter. I know you brewed this while ago but do you remeber the OG and anticipated FG? Is there anything you would do differently about this one were you to do it again? The hop schedule looks great and I have been able to aquire all three varieties. Also I am guessing this was white wheat malt as well? Is this your favorite among the various IPAs you have brewed? Our current go-to IPA recipe is a slightly stronger version of this beer (closer to 7.5%), but this one is great, too. Color looks beautiful. I'm looking for a "lighter" summer-type sessions ale, but hopped up. This might be the one. I just finished a Pliny the Elder recipe from morebeer last weekend. But I need a lighter hoppy beer for starters. If you are looking for something light and hoppy, this recipe should fit the bill nicely.